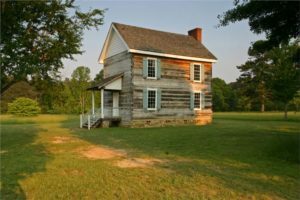 The New Echota Historic Site in Calhoun, Georgia, preserves remnants from one of America’s most egregious eras: The Infamous Trail of Tears. In 1825, the Cherokee national legislature established a capital called New Echota at the headwaters of the Oostanaula River, in what is now Georgia. During its brief history, New Echota was the site of an early experiment in national self-government by an Indian tribe. The Cherokee printed the first Indian language newspaper office at New Echota, for example. New Echota is a profoundly significant Cherokee Indian site. Following the signing of a treaty which relinquished Cherokee claims to lands east of the Mississippi River, the tribe was assembled here for removal to the West on the brutal, deadly trek known forevermore as the Trail of Tears. Visitors can view 12 original and reconstructed buildings, including the Council House, Court House, Print Shop, Missionary Samuel Worcester’s home, and an 1805 store. The grounds also have buildings used for smoke houses, corn cribs and barns. Nature trails lead visitors to New Town Creek and a small beaver pond. At the visitor center, historians have assembled fascinating interpretive exhibits. Take time to watch the insightful 17-minute film that offers an unforgettable display of this site’s enormous value. New Echota Historic Site is at 1211 Chatsworth Highway NE, Calhoun, Georgia, 30701. Take I-75 to Exit 317 in Calhoun, GA. Go one mile east on Ga. Hwy. 225, and you will be there. They’re open Wednesday through Saturday from 9 AM until 5 PM. As with other state parks, this site is closed on Thanksgiving, Christmas and New Year’s Day.